I've suffered from Anxiety and Panic Attacks for the last 7 or 8 years now. They are life changing, embarrassing, scary and come with some horrible side effects. Today I thought I'd share my story and hopefully get to hear some of your stories too! All of a sudden you get that feeling of dread, the color drains from the world and the hair on the back of your neck stands on end. You can't breathe, you feel sick, dizzy and disorientated. Your hot and you suddenly realise just how crowded it is in here, you need to get out and fast. The more you think about getting out the more you can't breathe. You get pins and needles, the shakes and you're terrified you're going to pass out. The walls start closing in and before you can even comprehend what's happening you're ditching the situation you're in for somewhere cold, empty and most importantly, a million miles away from where you were. And why you ask? You have absolutely no idea. This has been my life for some time now. Thankfully due to CBT (Cognitive Behavioural Therapy) I can somewhat control them but there isn't a cure. I remember my first ever panic attack, although I didn't know what it was at the time. I was 19 and just passed my driving test. I was driving down a road and all of a sudden, I couldn't breathe, I felt nervous, sick and dizzy and had to pull over until I felt better. I marked it off to being unwell and had soon forgotten about it. A mere 12 months later, I was housebound. I couldn't even walk to the shop by myself without having a full blown panic attack. 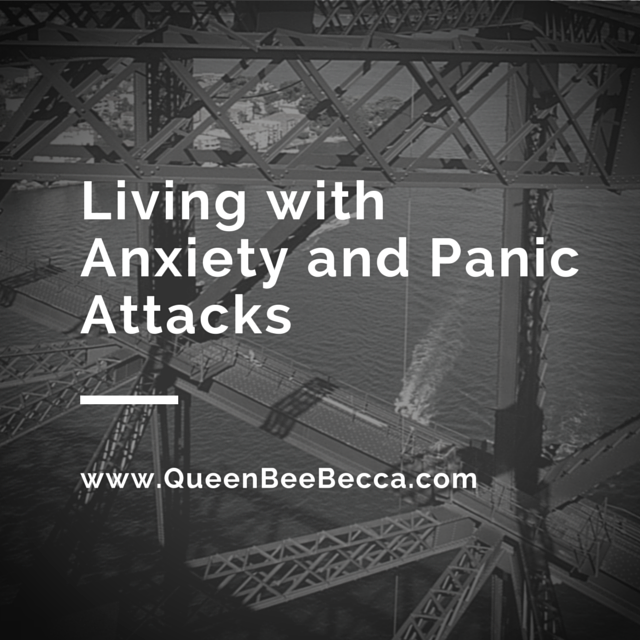 The fear of having a panic attack made my anxiety worse and I'd worry about having them to the point I used to bring them on. I remained that way for about three years. I couldn't work, I couldn't pop to the shops, I couldn't just go out and get over it. I piled on the pounds and I ballooned to a massive 21 stone 4lbs, I used food as a crutch as I didn't really have anything else in my life to distract me. I sat indoors, depressed, lonely and jealous of everyone my age who was out enjoying life. I hated my life and knew it needed to change but I didn't know how to do it. I felt guilty about constantly letting down my other half and my family and I was slowly loosing my friends as every time I was invited somewhere I couldn't go. Until one day. I'd finally had enough, I knew it had to change or I'd end up this way forever and it's no way to live. I rung the doctors, made an appointment and forced myself to go. I had to wait outside the doctors waiting room, I couldn't even sit in the same room as other people without wanting to run away screaming. My anxiety was making my skin crawl and I was paranoid people were judging me but I when I finally got called in, my life changed. I was offered a range of various solutions and honestly wondered why I had waited so long. From medication to therapy, my doctor explained my choices and said it was totally up to me. If one didn't work there was always another route. I initially chose the medication route as I was put off by the sound of therapy and as CBT is group therapy it really wasn't something I felt ready for. The medication I was prescribed was Prozac. To start with the pros of taking medication definitely outweighed the cons and I was able to do the things I'd long so badly to do. A few months down the line however, I started to feel the cons were outweighing the pros. I felt like a zombie, nothing felt real and I felt like I was living in a dream world. Although it stopped the panic attacks it also muted all my other emotions too. Another doctors appointment later I had signed up to therapy but was totally convinced it was all going to be a waste of time. I mean, group therapy?! That was for addicts wasn't it? I had a 12 week block of therapy classes and by week 4 I was back to my old self. I couldn't believe not only did group therapy work but I was actually enjoying it. Panic attacks and Anxiety make you feel totally isolated. It's something people don't talk about openly and I honestly don't understand why. You are not alone, there is no need to feel alone and there is absolutely no need to ever feel embarrassed. You learn what causes your panic and how to control it. In no way does CBT make your panic attack and anxiety disappear but it does make it a hell of a lot easier to live with and understand. It is hard work too, don't go into it thinking you'll go to group, talk about your problems and they will all melt away. You will have 'homework', you will have to set yourself challenges and sometimes you will fail. After my classes, I was able to start work again. I joined Slimming World and although I'm still on my weight loss journey I've so far managed to drop over 8 stone. I've got married, gone on holiday, gone shopping alone and most importantly found myself again. By no means am I cured, only last year I had a 'relapse' and got signed off work for two weeks as they came back, badly but it was stress related and another round of CBT and I'm back to normal life. I still have the odd panic attack and the odd bad day but I've learned to not let my fears take over my life and sometimes it is just sheer stubbornness that get's me through! I really hope this helps anyone, even one person, who is going through something similar. You are not alone, you aren't weak, you should never feel ashamed or embarrassed and most importantly it doesn't have to be this way. If you ever need someone to chat to or would like to chat to someone who's tried both the medication and therapy routes please do get in touch! I learnt lots reading this :) so thanks. And wow, well done on losing 8 stone! !